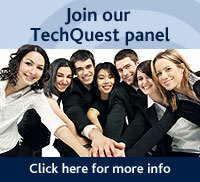 Welcome to IDC Canada’s TechQuest panel! Membership in our TechQuest panel is designed for information and communication technology (ICT) professionals and business executives – people who have knowledge of or influence over the IT decision making process. TechQuest surveys ask a wide range of questions relating to their use of, expenditure on, resourcing for and challenges with information and communication technology. IDC then compiles this information for use in forecasts and end-user reports which are used by Canadian and global technology and telecommunications vendors. Participation is quick! Surveys usually take just 15 minutes. Our panelists complete 5 to 6 surveys per year, on average. Participation is easy! Conducted via the web, the survey is available 24 hours a day, allowing panel members to participate when it is most convenient.